Starting today, you'll notice something new about President Obama's Facebook page and his Twitter account, @BarackObama. Obama for America staff will now be managing both accounts, posting daily updates from the campaign trail, from Washington, and everywhere in between. You'll be hearing from President Obama regularly, too; on Twitter, tweets from the President will be signed "-BO." As the President said when he launched this campaign a few months ago, he's focused on doing the job we elected him to do — so he's counting on all of us to lead this organization from the grassroots up, helping to shape it as it grows. One way we're putting that idea into practice is by taking the reins of these Facebook and Twitter accounts. This change will give us new opportunities to make the most of these channels, using them not only to report what the President is doing every day but to connect to the millions of supporters who will be driving this campaign. We'll be asking for your feedback and ideas, updating you on ways to get involved, sharing the best stories that cross our desks, and maybe even retweeting you every now and again. What else should we be keeping in mind as we make this switch? We're hoping you'll tell us. Let us know what you'd like to see on the President's Facebook page and on @BarackObama by shooting us a comment or tweet, or by leaving your thoughts below. 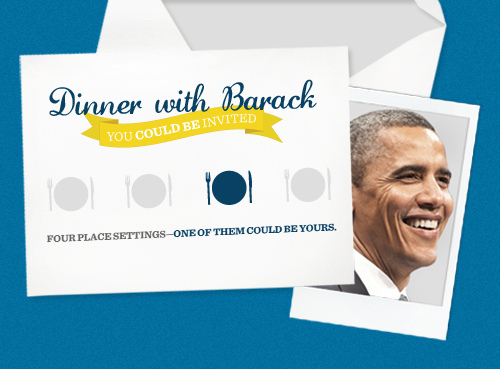 Have you replied to your invitation from President Obama for the chance to join him for dinner? Don’t forget to send in your RSVP here. No purchase necessary. Entries must be received by 6/30. Approx. retail value of prize: $1,075. Odds of winning depend on # of entries received. Promotion subject to Official Rules and additional restrictions on eligibility. 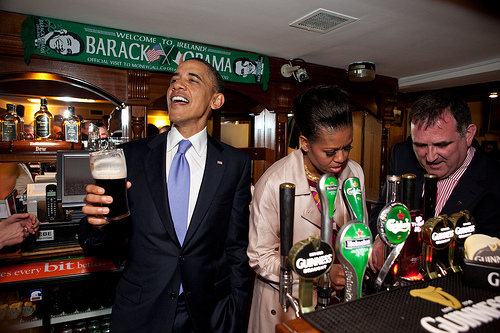 Sponsor: Obama for America, 130 E. Randolph St., Chicago, IL 60601. As an intern during the 2008 election cycle, I learned a great deal about the ability to educate and persuade. My work consisted of calling and canvassing potential voters throughout the day to ensure that each and every one had the right information they needed to support then-Senator Obama. During last week’s summer organizer training, however, I became acquainted with another art form—one-on-one meetings. Shaking in my chair, nervous about holding my first one-on-one meeting, it took a good amount of effort to put that simple sentence together. Persuading individuals is one thing, but relationship-building is in a world of its own. I spent an hour speaking with Lynette about how she could get involved. We soon started thinking about how best to engage the Hawaiian community of Las Vegas. It turns out she knows local Hawaiian radio DJs and a member of the Hawaiian Civic Club of Las Vegas. With one connection, I may have just made dozens more. Community organizing at its finest. A new album of official White House photos from May captures moments from the past month of the administration—some serious, some not-so-serious. Take a look as members of the UK Parliament listen to the President's speech at Westminster Hall, President Obama visits families affected by the devastating tornadoes in Missouri, and First Lady Michelle Obama takes part in a Pit Crew Challenge on the White House lawn.